This entry was posted in Design, The Future of Print and tagged aggregation, branding, content, design, digital magazines, Leo Laporte, new media, print, The Verge, This Week in Tech, TWiT, Ziff Davis Enterprise by John Bethune. Bookmark the permalink. I’m missing the point that the “future of content is its identity” and “the content must be imbued with the brand”. What does that mean? People discover content in a variety of ways but they always wind up back at the brand to read it. It’s not anonymous content because the link was found in Facebook. And the container matters if you want to keep people hanging around on your site reading more beyond the link that brought them there. 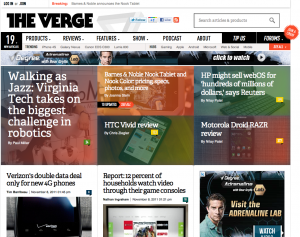 Which I find myself doing lately on the Verge site since I put their feed into my google reader a week or so back when they launched because the site is pretty slick. Great comment! So good, in fact, that I’ve made a new post out of my response. Thanks for the healthy dose of skepticism.